Cover the cashews with water and soak them for 2-3 hours. Drain the cashews and place them in a highspeed blender. Add the garlic, water, olive oil, and sald to the blender and blend until smooth, using the blender plunger to help the ingredients come together. Add your leftover veggies, shrimp, or other meat with the water or stock to a skillet to warm up. 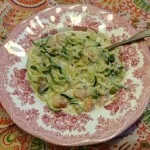 When warm, add the spiralized zucchini and stir a few minutes until it warms and softens. Add the cashew alfredo sauce, stirring it in until warm, and serve!